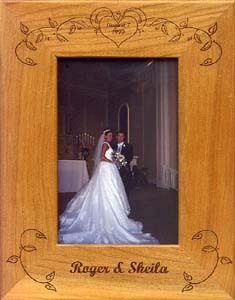 Make that extra special photo from your wedding shine in your new home with an engraved wedding picture frame. We have several to choose from to make the perfect gift for your home or for your parents to remember your wedding. From you engagement to the wedding, special photos will stand out and need a special place in your new home. Not just any frame from the department store will do. It needs to be personalized with your names and dates to last a lifetime. 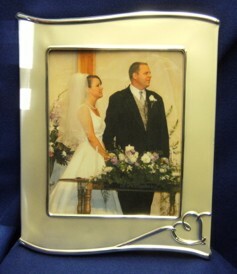 Forevermore Lenox Wedding Photo Frame. The frame matches up with Forevermore series of Toasting Flutes, and Wedding Cake Server Sets. Price includes couples first names and wedding date engraved. Cherry wood frame with leaves forming a heart the the top. We engrave the couples wedding date in the heart. At the bottom, we engrave the couples first names centered between leaf vines. A very elegant frame for your favorite wedding photo. Horizonital lay-out only. 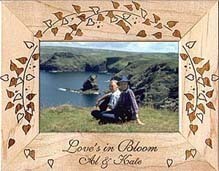 You can engrave names and date or follow the lay-out in the sample - Love's in Bloom (first line) and couples first names on the second line. WED004 Hearts Photo Frame 5" x 7"
Silver plated frame with double heart design accented with crystals. This frame will make your wedding photograph a must look at picture. In the top corners of the frame in the heart are two love birds. Beautiful detail will enhance your engagement photo. After every wedding you will have a bunch of photographs of the wedding that family and guest have taken. Some of these are keepers and need a special place. This album is the perfect solution. 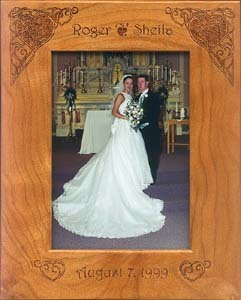 We engrave the couples first names and wedding date on the cover at no additional charge.